This video contains some excellent safety lessons, supplied by Dave Hoffman’s voiceover commentary. 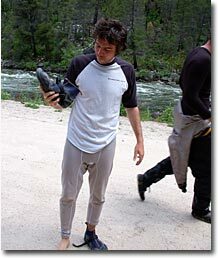 Participating in this whitewater run and the subsequent rescue were Mike Northrop, who took the bad swim, Rich Hardy, Mike Gottlieb and Korey Dausz. A few years ago, several good friends and I took a boating trip to Idaho. It was the peak of snowmelt that year, and the rivers were raging. After an amazing two days on the South Fork of the Salmon River, we finished the shuttle and camped near the incomparable mountain town of Yellowpine. The next day, we paddled a high-flowing East Fork of the South Fork (EFSF). Mike took a huge, long swim, just barely making it out of the river. I had my helmet camera on and caught the entire episode on video. After he finally got to shore, I stopped kayaking for the day; I just didn’t want to see that go down again. No matter how bad a rescue situation gets, there is always something a victim can do to improve the outcome. Mike was exhausted and injured. He spent about four minutes swimming through hundreds of yards of icy Class IV-V rapids, and yet he still managed that last burst of energy to drive himself to the shore. Most fatal whitewater accidents occur because of a combination of factors. Mistakes and bad decisions compound each other and lead to situations that could have been prevented. It was a hot sunny day. Ben, our shuttle driver, was wearing a t-shirt and shorts. Despite the heat, we all made the decision to don our drysuits. If Mike had been in lighter gear, I don't think he would have survived. Proper attire saves lives. Flush drowning is a particularly relevant subject to be aware of in the Pacific Northwest, where I live and paddle. A flush drowning occurs in whitewater when even though the victim has on a PFD, the force of the water prevents getting to shore and water is aspirated. Fatalities in my part of the country are often related to extended swims in cold water at high flows. 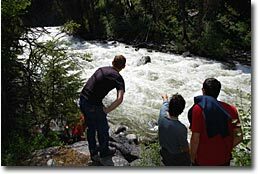 You can learn the history of whitewater accidents near where you paddle by perusing American Whitewater's Accident Database. Though you might consider it morbid, this is one of the best ways to learn from the misfortune of others and separate whitewater fact from whitewater myth. The Accident Database is just another good reason to join and support American Whitewater. Towing a swimmer to shore is hard. And in the situations you most need to do so it is even harder, if not impossible. This episode reinforced my belief in the paramount importance of self-rescue. Friends are great to back you up, but if you end up in the water, you are your own best rescuer. Despite all that was happening, Mike was calm. A little smile flashes across my face when I remember him apologizing for causing me to get momentarily stopped by holes. That was the worst swim I’ve personally witnessed and the calmest swimmer. He kept his head, and it made a huge difference. I think a lot of that calmness was due to how much time Mike has spent intentionally swimming in whitewater while teaching swiftwater rescue and kayaking. You need to practice rescue skills in order to be able to use them. Paddling rivers at high water is inherently more dangerous. The lack of eddies and the continuous nature of the EFSF made rescue incredibly difficult for Mike once he ended up in the water. I don’t think the river was too high to be paddled that day. It was not flooding. But it was certainly more risky than paddling at a moderate flow. A side point worth mentioning is our complete disregard for Mike’s gear. No one was going after anything until we got him to shore. We ended up getting his boat, lost the paddle, but these things are a minor part of the big picture. I can’t count the number of times I’ve seen seven or eight folks charge after a boat when only one is going after the swimmer. Don’t do that! Flush drowning is a real, legit hazard, even when paddling with a well-trained, close-knit group. Dave is the Kayak School Manager at Next Adventure, a Portland, Oregon outdoor store. He has taught kayaking for 12 years and paddled for nearly 20. His favorite quote is “The best kayaker is the one having the most fun.” His website is theriverlifestyle.com. Thank you Dave, for sharing this with us!